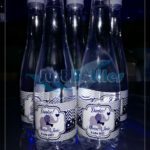 Just Bottles specialises in bottling water with your own unique branding and we offer you the opportunity to Custom ize or Personalise your bottled water for any special event, corporate branding or occasion. Functions include: Weddings, Birthdays, Bridal showers, Baby Showers, and any corporate event. UV & Reverse Osmosis purified treated water. The bottling plant based in Pretoria, Gauteng will insure you only give your guests the best, refreshing, pure water with adding a personal touch. Artwork & proofs will be sent before labels are printed. Price of personlised branded bottles are as follow: 500ml @ R6-00 per bottle and 330ml @ R5-00 per bottle. We do charge a ddesign fee of R150 for artwork.The minimum order is 20 bottles per order. Labels are rain & weather proof. Order process time is 5-10days, in order to ensure fresh water bottles is ordered and labels artwork printed. Add your cusomized label of you choice to your bottles for almost any special occasion. Artwork for personlised bottles & proofs will be sent before labels are printed. We offer a variety of conceptual solutions to suit your brand, style and image. All of these are available depending on the quantity and logistics involved. We will then receive your proof of payment and process the order. Please remember to include all if the important information to assist with the design. The artwork will be send the designers to design your personalised label. You will receive 2 different designs which you can choose from. From there the bottling of you personalised branded bottles starts and you can collect at Moot Street in Pretoria, Gauteng at Just Bottles 5- 10 days after approval payment is received. The PET water bottles supplied by Just bottles are BPA free which makes it safe to use for liquids. The water used to bottle the personalised branded water is purified by using Reverse Osmosis water purification process and ozonation. Personalised branded water bottles with Purified water labelled with your brand adds remarkable value to the overall image of your company and products, and is exceptionally effective for special events. Personalised branded water bottles are a sure to reach every member – and beyond. Why promote a water company when you could be promoting yourself? Just Bottles have a wide range of options for labelling your personalised branded water – we can put almost anything on the label itself and we’re happy to help with the design if you don’t have existing artwork. Choose from your wide range of sizes – from 330ml, through 500ml still, Sparkling and flavoured water. Just Bottles maintains very high standards of purity in all our branded water, and we’re confident there’s no better product on the market. With a clean, fresh taste, our personalised branded water is a must have at every occosation. 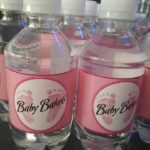 Just Bottles personalised water bottles are an ideal branding solution for any Special day or coporate event. From fundraising events and product launches to golf days or corporate sponsorship – branded water is a great idea for anything your business has an interest in. Get a quote for your personalised water bottles today by calling Anneli on 072-876-7884 and let the creativy start. Personalized sports bottles are a great way to promote your hiking or outdoor sports company. Just Bottles, you can add your own artwork to branded bottles. We supply personalised branded water bottles to more than 10,000 stores and event companies based all over Pretoria and Johannesburg. Our sales and service team is available seven days a week to assist in your design or to provide a fast, accurate quote for your order.